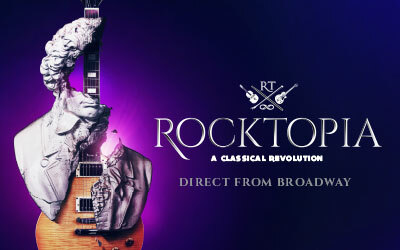 Direct from its smash-hit run on Broadway, the international music sensation Rocktopia comes to State Theatre New Jersey for one night only on May 5! Creator (and performer) Rob Evan chats with us about how he came up with combining classical and rock music and what the audience can expect at the show. Bert: Hi again, and welcome to All Access with State Theatre New Jersey. This is the show that takes you backstage, behind the scenes, and behind the curtain at the legendary State Theatre New Jersey in downtown New Brunswick. Brand new show for you this week. I am Bert, joined by State Theatre’s Director of Communications Kelly Blithe. How are you today, Kelly? Kelly: I’m good Bert. How are you? Bert: I am ready to start off the show this week. How about a little bit of Rock and Roll to get things rolling for us this week? Kelly: I like it! Where are you going? Bert: How about Sunday, May 5 at 7:30pm, with a show that was incredibly successful on Broadway, and it is now coming to the State Theatre stage. Kelly: Are you talking about Rocktopia? Bert: That would be the show. Why don’t you introduce our guest for today? 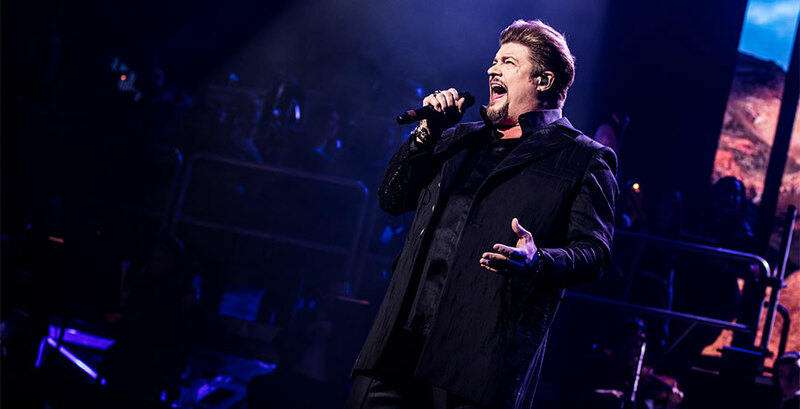 Kelly: With us today is one of the members of Rocktopia, Rob Evans. Welcome Rob! Rob: Thank you very much. Good to be here. Kelly: So Rob, for people that do not know what Rocktopia is, tell us all about it. Rob: Well it’s my brain child. I grew up singing classical music, but I also was in a lot of rock bands, including Trans-Siberian Orchestra. I kind of saw this vision that I wanted to fuse the two; so I mixed Beethoven with Led Zeppelin, Queen with Mozart, and things like that. It has gone pretty well. Bert: This style and approach to this is just amazing Rob. There are so many great projects from over the years that have really taken this to the next level. Think about Metallica working with a symphony. Bert: Yeah, and what I was getting to was that we have seen this done over the years. Sometimes great, and others not so great. I use the Metallica as an example, and you are right that that’s as good as it gets. That’s what makes your show so special. Rob: I don’t pretend to be the first guy to mix these to genres, but it’s just the way that we do it that is a little different. So, it has gone pretty well. We did PBS in Budapest, we’ve taken it on tour, and we played the Broadway Theatre—which is where I made my debut as Jean Valjean in Les Miserables. Now we are going back out on the road, and we are heading your way. Kelly: Nice. So tell us about the process. Do you start with a classical piece and mix in the rock, or a rock piece and mix in the classical? Rob: I start with a rock piece. I have collaborator, Randall Fleischer, that was the maestro for a lot of symphony oreshcras and has a background in classical music. My background is more so classic rock. We both appreciate both genres. I’ll come up with things and he will arrange and perfect it. Bert: I love the way you guys are doing it. You can just fuse some classical instrumentation to plug the holes in the riffs in rock music. I think no one does it better than you, and I am being serious. Rob: Well I appreciate that. We are working on a Christmas version, so we are trying to get even deeper in the fusion. Some of the songs originally, we would start with a classical piece then morph into a classical rock piece, but we are really trying to fuse deeply. It’s a fun project, and we have a good time with it. People respond, which is lovely. Kelly: Yeah, you know I love that it in many ways is an introduction to classical music for some people. Rob: Well, that’s right. I saw it as a dying art form. They get a little bit of education, even though they don’t know it, and the Rock and Roll. Bert: And the way you are doing it is awesome. Unfortunately, it took an Oscar® winning film about Queen to get 20-somethings into the music of Queen. Now you are taking that to a new level. Kelly: What I do love about you Rob is that you wear so many hats. Not only are you a performer, and producers, but you are a member of the Trans-Siberian Orchestra. So many different music worlds mixed together. Tell us about that? Rob: It’s who I am, I’m an artists. That’s the reason I created Rocktopia. Paul O'Neill was my mentor, and the creator, producer, composer, pretty much everything of the Trans Siberian Orchestra. I’ve played in front of 20,000 every night at the Garden or Prudential Center, and different places like that. O’Neill really just cared about the artform, and that is what I lean into with my own idea. It is very different than Trans-Siberian Orchestra, but I kind of use everything he has taught me not only for financial success, but for musical success. Bert: You think about the riffs that are in this, whether it is the rock or classical. People know this stuff right away. “Smoke in the Water”? Rob: We call them the hooks. They’re big hooks. Beethoven wrote big hooks, Mozart wrote big hooks. “Smoke in the Water” was a big hook, and that’s what people react to. I’m not trying to be pretentious and educate people, but these genres are timeless. That’s the thing I wanted to perpetuate again. That’s why people jump to their feet for our show, and I feel really blessed. Kelly: Mozart and Beethoven were the rockstars of their day, right? Bert: Of course they were. Mozart especially, dude would have been out of control if he lived in our time period. Kelly: Right. What I also love is your roles on Broadway, you’re an accomplished actor and singer. There has to be like two different Robs, right? You got rock Rob, and Broadway Rob. Rob: Yeah, I mean I don’t know. I’m just Rob. I’m a gemini, born in June; there are two sides to me—that’s why I play Jekyll and Hyde. I am all over the place, but it’s fun. I get to watch some people smile, and help them relive some of their past. We did a lot of work research to see who our demographic was, and they are about my age, which is late 40s. However, when we hit the road, I saw a lot of kids out there, and it’s cool to see them respond to this music. I am not a giant fan of new music right now, I appreciate it. I love Bruno Mars, and I think he’s a great artist. I saw him at the garden not to long ago. Pat Monahan is a good friend of mine from Train. But there is other stuff that I don’t like that much. The thing about classic rock is that the themes are epic and timeless. Bert: I am trying to imagine what Beethoven tour would look like in today’s world. Rob: Well first of all, he was deaf. For him to be able to compose his stuff was nuts. Also, with Trans-Siberian Orchestra, I got to play Beethoven. And that started my thinking, “Oh my gosh! There is something here I really attach to—emotionally attached to.” It was pretty cool. Bert: If you could make a band with anyone living or dead, who would you pick? Rob: Oh man, that’s deep. Bert: It was meant to be a deep question. Rob: That’s the biggest question that has ever been asked to me during an interview. Mozart would probably be there. If I’m being honest, Steve Perry would be there to do lead vocals when he was killing it. Lou Gramm would be there somewhere to make a cameo when he was killing it. Brian May would probably be on guitar for me. Jager would probably show up for a hot second, just walk across the stage with swagger, but then I’d kick him off and tell him to go take a break. So, that’s where I’d begin. I’d have to do some homework on that. Kelly: Nice. So, for anyone that is on the fence about seeing Rocktopia, what would you say? Rob: It’s interesting. Our tickets are priced reasonably. You don’t have to go into New York City, and spend $200 on a Broadway show. We are a really family friendly show, so it's the perfect show for people to bring their grandparents and children. We still dig into Rock and Roll, and provide a bit of the classical. People won’t realize, but they will know the themes, which was super important to me. You may not know it as “Also sprach Zarathustra”, but you’ll think of it as the theme of Space 2001. So there is a lot going on. We have some world class vocals, that I am just humbled to share the stage with. It’s really just a fun night, we end on such a high note, and there is so much joy going on. People walk away just smiling. It’s been a hard show to brand and tell fans what they are about to see, but it’s fun to stand on stage and just watch people have these eye opening moments. Kelly: Well we definitely look forward to those eye opening moments very much. 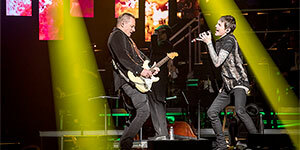 We look forward to seeing Rocktopia May 5, at State Theatre New Jersey. We will see you then.